Target 3 Billion: Innovative Solutions Towards Sustainable Development is an amazing read about how we can make this world a better place. This is a book by the visionaries APJ Abdul Kalam and Srijan Pal Singh, and it explains how India can eradicate poverty. Nearly 40 per cent of the population of the world, (about 3 billion) lives below the poverty line. The people who fall under this category are deprived of basic amenities like health, food, education and everything else that can help them lead a decent life. Bharat Ratna awardee Dr. A P J Abdul Kalam has been trying to tackle this crisis for years together and has come up with some very interesting and intelligent solutions. This book effectively manages to capture and explain his thoughts on how to wipe away poverty from both India and the world. Dr. Kalam suggests a sustainable development system called PURA that can directly assist the 750 million people living in Indian villages. 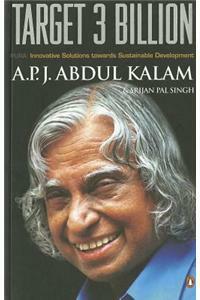 It is an inspiring read and Dr. Kalam and Srijan Pal Singh succeed in touching the humanitarian side of every reader. The book strikes the right chords when Dr. Kalam picks out examples of entrepreneurs and individuals who have contributed towards changing society for the better. Fondly referred to as the 'People's President' during his term from 2002 to 2007 as India's 11th President, Dr. Kalam has been on the forefront of many revolutionary movements in the country. A scientist by education and profession, he was also known as 'The Missile Man' during his term as president. Through his books and missions like 'What Can I Give' for youth in 2011 and now PURA (Provision of Urban Amenities in Rural Areas), Dr. Kalam shares his plans and visions for a better and brighter future for India. He is a visiting professor at IIMs across the country. Srijan Pal Singh was one of the few IIM-A students who had turned heads by choosing politics over placements after graduation. Singh has been working closely with Dr. Kalam on missions that focus on sustainable development solutions in rural areas.